We all know that in life, there are both lean times and times of great abundance. A timeless costume that you can wear on not just one holiday, but two definitely falls into the “abundance” category. And that seems like something you ought to be really thankful for, don’t you think? Feast your eyes on a look that can delight the masses no matter what occasion you wear it for. Maybe you would like to enjoy a glorious feast with friends and family or you care to add festive cheer to a haunted Halloween house. 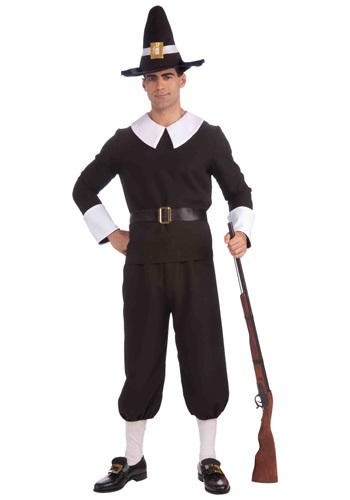 Either way, when fall arrives you will be ready to welcome its bounty of brilliant occasions in this Adult Pilgrim Man Costume. This outfit will put you in the kind of peaceful state of mind that only comes from overdosing on turkey, stuffing, and cornbread (without the same caloric impact). Talk about satisfying! No doubt about it, this costume is a practical cornucopia of character-building details, from the black shirt’s white collar and cuffs to the black cropped pants. The black belt and the pilgrim hat both boast gold plastic buckles--because really, what is a pilgrim without his buckles? Pair this look with a toy musket and a sense of overwhelming gratitude (and maybe even a Native American costume) and it will prove to you, time and time again, why you should be very thankful to have found it!